Zhongshan Kangfu Electric Appliance Co., Ltd.
KangFu CO., Ltd and its USB wall socket is a all new design, the product have a new USB power module and it can control the power output depends on what your electronic equipments need. the USB sockets are suitable for charging and powering mobile phones, Blackberry's, ipods, iphones, ipads, PDAs, MP3 players, game consoles, digital cameras and more. 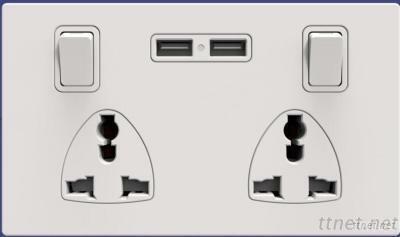 the USB sockets complies to safety requirement, including EMC, LVD, CE etc. the product must to be warm welcome with good outlook and its excellent performance we believe we can give you excellent products.